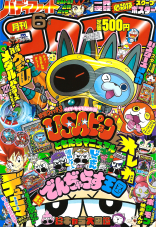 The manga adaptation of Pokémon The Movie XY "The Archdjinn of the Rings, Hoopa" was printed in CoroCoro Comics, a manga anthology magazine that goes on sale around the 15th of every month. 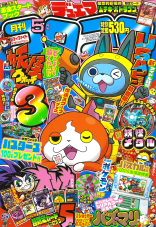 The first chapter premiered in the May 2015 issue. A hundred years ago, Hooba Unbound is floating over an ocean, controlling two giant Rings floating in the air. A crowd has gathered at the shore. Hoopa Unbound says the word "Appear~!" and before long the legendary pokemon Groudon and Kyogre emerge from these Rings! Groudon angrily attacks with a blast from its mouth but Hoopa uses its finger to draw a Ring that absorbs the attack before it can connect. It then takes this Ring and fires the blast at Kyogre in the water below. Suddenly more legendary pokemon - Reshiram, Zekrom, and Regigigas - join the fight as well. Heavy winds begin causing havoc in the nearby city, causing its townspeople to wonder what's going on. "Why are they fighting?" one man asks. While all this is going on a man in tattered clothing and a unique pendant calmly walks toward the battle. He looks up at Hoopa and produces an urn that begins to glow with a fierce light. Hoopa Unbound begins to writhe around in pain as it's sucked into the container. In the present day, a man named Balza is riding his Warrgle through a desert valley. The two of them eventually stop at a crescent-shaped rock formation that seems to have been turned into a shrine to the urn. Ropes with scrolls hanging off them create a spider web that is used to keep the urn suspended in midair as a dark aura surrounds it. Balza, who happens to have the same pendant as the urn's previous owner, approaches the item and declares that he will break its seal. He recites an incanation and the ropes holding the urn in place break. It flies into Balza's hand where the dark aura begins to take over his body. Elsewhere, Satoshi and his friends enjoy swimming in an outdoor pool at what appears to be a nice hotel. Eureka spots a bunch of pokemon off in the distance; a Kabarudon, Hippopotas, Digda, and Dugtrio. Citron is tinkering with some gadgets away from the pool. Harimaron and Yancham are using his screwdrivers to pretend sword fight, prompting the Miare City Gym Leader to tell them off. Serena walks toward her friends with a plate full of donut-shaped Pofflé and sets them down on a table. Let's dig in! Serena tells her friends that if they want to eat more donuts then they should head to nearby Dessert City since it's famous for its donuts. It's also apparently a place where mysterious pokemon are said to appear. Satoshi perks up at the mention of mysterious pokemon and decides that they should head there next. Our heroes are having a good time and don't notice the small hand that reaches out from the other side of a Ring. It grabs one of the Pofflés off the plate and switches it out with a Matoma Berry. Harimaron, who didn't see a thing, takes the Berry without looking a takes a big bite out of it. "Hariii!!??" it screams out as flames shoot out of its mouth. 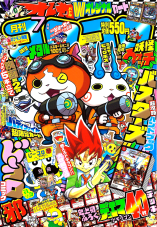 Eureka excitedly proclaims that Harimaron's learned how to use Flamethrower but Citron says that's impossible. Serena notices that Harimaron just took a bite out of a Matoma Berry, a Berry known for being extremely spicy. But what is it doing there? Satoshi turns around and sees the hand come out of the Ring again and take the last donut. He runs over, grabs the thief's hand, and is pulled into the other side along with it! Serena and the others look on dumbstruck. "Appear~!" Satoshi and Pikachu come out the other end of the Ring as Hoopa, a being much smaller and cuter than the monster who went on a rampage 100 years ago, holds up its donut. Satoshi picks himself up and soon realizes that he's been transported to Dessert City! He looks a the Ring floating in the air and wonders if that's how he got there... Hoopa takes the Ring from the air, returns it to its horn, and introduces itself. Satoshi introduces himself and Pikachu as well. Hoopa decides to call them "Saton" and "Pikan," annoying the young Trainer! Hoopa asks "Saton" if he really likes "Pikan" and he says that of course he does. Hoopa responds by taking the two Rings off its horns and using them to summon hundreds of Pikachu! "Are you surprised? Can you tell which Pikan is yours, Saton?" Satoshi walks over and effortly picks out his Pikachu out of the huge crowd, much to Hoopa's surprise. A young woman named Mary sees the Pikachu that Hoopa's summoned and angrily demands that it return them all at once. If it doesn't, she threatens, she won't give it any more donuts. Later, Serena and the others are together with Satoshi in what appears to be Mary's house. It turns out that Hoopa had used its Rings to have Satoshi pull his friends through the portals, one by one, until they all got transported to Dessert City! Mary introduces herself and says that she takes care of Hoopa. When Serena tells Mary that they were thinking of heading to Dessert Tower she announces that she and Hoopa were planning to do the same. Eureka suggest they just use Hoopa's Rings to just transport there but Mary calls out for them to stop. Hoopa rushes into its Ring anyway but is soon rejected! Mary reveals that Hoopa can't go through its own Rings so our heroes decide to just walk to the tower instead. Just then, Balza flies in on his Warrgle, clutching the urn. Mary is happy to see her older brother and asks if he was able to find the Confinement Urn. Without saying a word, Balza points the urn to Hoopa and removes the top, enabling the dark power to leap out and shower the pokemon in evil energy. Hoopa writhes in pain before succumbing to the power and begins its tranformation into its true form, Hoopa Unbound! 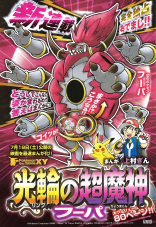 Hoopa Unbound is about six meters taller than Hoopa Confined and absolutely towers over Satoshi and his friends. Up above, the Rocket-Dan are flying in their hot air balloon. They quickly recognize Hoopa as an extremely strong pokemon but see the Confinement Urn as being the better treasure. After all, they figure, it has the power to power up pokemon and make them super size! The dark power that had grabbed ahold of Balza releases him, causing him to drop to his knees and wonder what just happened. Hoopa Unbound, meanwhile, creates six Rings in the air. It attempts to grab the urn from Balza's hands but the "eyes" of the urn glow and emit and power that prevents Hoopa from touching it. Hoopa then reaches into one of its Rings, grabs a piece of a nearby skyscraper, and hurls it at Satoshi and Pikachu! Pikachu uses its 100,000 Bolts attack to destroy the building, sending debris flying everywhere. One of the pieces of debris hits the Rocket-Dan's balloon and sends them blasting off. Balza believes that Hoopa is trying to destroy the Confinement Urn so Mary steps forward, takes the urn, and declares that she will reseal Hoopa before it has the chance to do so. As she points the urn toward Hoopa Unbound the dark energy is sucked out of it until the pokemon reverts back to its confined state, unconscious. With great effort Mary manages to close the lid before a powerful shock causes her to drop it. Serena runs over to pick it up but Citron tells her to stop; there's clearly an evil power inside! This is where he steps in: Citron will use his "Fully Automatic Lifting Machine!" (全自動持ち上げマシン), which is basically a vice attached to his Aipom Arm, to allow them to carry the urn around without having to touch it. Eureka comments on how straightforward the name is. Satoshi rushes over to Hoopa and asks if it's OK. Hoopa, who's just now coming to, says that it felt like it was going to disappear. "It was dark...it was scary..." Mary takes Hoopa into her arms and says that if Hoopa had been allowed to continue its rampage then the same thing that happened 100 years ago would happen again. Satoshi asks her what she means, and Balza says that the city was destroyed. A hundred years ago Dessert City was a small town. Hoopa Unbound used to come to town and go around helping itself to the townspeople's food, causing everyone to see it as a nuissance. In order to placate the angry townspeople Hoopa used its Rings gift them gold and other treasures. Thanks to this new cash flow the townspeople were able to transform the small town into a huge and vibrant city. The townspeople built a sort of shrine to Hoopa that eventually turned into somewhere they went to have their wishes granted. One day, a boy made a comment that changed everything: "You seem real big and strong. But what would happen if you fought other pokemon? Would you win?" Hoopa Unbound answered the boy's question by summoning a Kairyuu and a Haganeil and easily defeating the two of them in battle. Many more pokemon were summoned and many more pokemon were defeated, and it didn't take long for the whole thing to became a spectacle. The more people cheered, the more Hoopa fought. Eventually, Hoopa Unbound would even start to summon legendary pokemon to prove its strength! But one day it summoned too many and a massive free-for-all broke out. Balza says that the rampage was stopped when their great-grandfather used the Confinement Urn to seal Hoopa's power. Mary adds that Hoopa turned into its Confined form after its power was sealed inside the Confinement Urn. Our heroes head to a nearby Pokemon Center to let Hoopa rest. Balza takes off his pendant and asks the others if they've ever seen that shape before. Satoshi has a feeling that he has seen it before but he can't quite put his finger on it. Citron takes Serena's computer book thing and brings up a page on Arceus, the pokemon who's said to have created the world! Balza confirms the connection and says that their ancestors were endowed with the pokemon's power long ago. Their great-grandfather, he adds, had a greater amount of power than usual. After sealing Hoopa away - something no one really knows about, by the way - he took Hoopa back with him to his hometown, the oasis known as the Arche Valley. Their great-grandfather tells Hoopa to wait there but Hoopa doesn't want to; it just wants its power returned to it immediately! Hoopa tries to pass through one of its Rings but is bounced back. Balza's and Mary's great-grandfather tells Hoopa that as long as it doesn't realize the error of its ways then it won't be able to pass through its own Rings. "The world isn't yours" he says. "The world you see through your Rings isn't all that's out there." Hoopa complains that it has no idea what he means. Their life together started soon after, and at first Hoopa was confused about what was going on. Eventually Balza and Mary were born and Hoopa took a liking to them; after all, they were little just like it was! Mary says that one day, they wanted to see what was outside the valley and so she and Hoopa went out into the forest together. They got lost and Hoopa came down with a fever so Mary just broke down and started crying. Luckily for them, Balza finds the two of them and helps Mary carry Hoopa to a nearby cave where they nurse it back to health. The pokemon eventually wakes up and announces that it's hungry; looks like Hoopa's back to normal! A relieved Balza, Mary, and Hoopa head back to the valley. They are soon greeted by their great-grandfather, who's aged considerably since the last time we saw him. He hugs all three of them. "You came back! Thank you!" he says. Hoopa wonders why he's thanking them. "Because you're precious to me." Mary tells our heroes that after their great-grandfather passed away, she and her brother started wondering if it was OK to return Hoopa's power back to it. They believed that Hoopa's different from the way it was before and that if it had access to its full power then it would surely use its Rings for good. Satoshi adds that, based on what he's heard, Hoopa was only trying to make everyone happy when that rampage broke out and yet it's the only one to get punished. Seems kind of unfair. Hoopa floats over to the Confinement Urn, which is still sitting inside Citron's machine in the next room. Citron asks Hoopa what it's doing. Balza steps in and announces that they're going to take the Confinement Urn with them into the Arche Valley. They want to find out why what happened earlier took place and adds that if they don't do that then Hoopa can never return to full power. Suddenly, a mechanical hand bursts into the Pokemon Center and takes the Confinement Urn! Our heroes rush outside to see the Rocket-Dan's hot air balloon hovering above them with Nyasu holding onto the urn! Balza warns Nyasu not to touch the urn but it's too late; the dark power takes over and compels him to open the lid! The dark power from inside the urn spills out and heads straight for Hoopa! The Mischief Pokemon struggles as the power tries to take over but Mary and Satoshi tell it to fight back. Mary's Arceus pendant starts to glow. After a great struggle Hoopa is able to fight back the dark power and drive it away. The force causes the Confinement Urn to shatter in Balza's hands. Satoshi catches the weakend Hoopa and asks if it's OK; it responds that it is. Suddenly, a dark shadow fills the room. The shadow quickly turns into a shadow version of Hoopa Unbound, a being completely separate from Hoopa Confined! This shadow Hoopa Unbound takes one of its hands and grabs the Rocket-Dan's balloon, sending the trio blasting off again. Balza thinks he knows what this shadow is; Hoopa's rage. The shadow Hoopa Unbound uses Psychokinesis on Satoshi and Hoopa so Balza calls out his Warrgle and orders it to use Air Slash. Balza guesses that this shadow Hoopa is the embodiment of 100 years' worth of anger and that it wants to erase the smaller, weaker Hoopa out of existence! The Air Slash attack stops the shadow Hoopa's Psychokinesis but doesn't seem to have done any damage. Hoopa decides that it has to do something. It takes off one of its Rings and uses the magic word "Appear~!" to summon the legendary pokemon Lugia! Lugia uses Aero Blast, knocking the shadow Hoopa Unbound into a nearby building. Our heroes decide to make a run for it while they still can. Once they're a safe distance away Mary wonders what they can do about the broken urn. Balza says they can make a new one, recalling how he had heard about their great-grandfather making one by combining the three powers of nature - Earth, Fire, and Water. They'll have to go to Dessert Tower to make it but Balza is worried that they won't be able to gather the appropriate pokemon together. That's when our heroes step in. For Water they'll use Satoshi's Gekogashira and for Fire they'll use Serena's Tailnar. But what about Earth...? Eureka goes up to Hoopa and tells it about the Hippopotas they saw back at the hotel so Hoopa uses its Ring to summon the Ground-Type pokemon to where our heroes are! Satoshi and his friends ask Hippopotas to help them out and Serena gives it one of her donut-shaped Pofflé's to help sweeten the deal. Hippopotas seems to be on board. Just then the shadow Hoopa Unbound finds them! Lugia's close behind, however, and attacks the pokemon with an energy blast from its mouth. As the two continue to battle, our heroes decide to split up - Balza and the others will use Hoopa's Ring to teleport to Dessert Tower while Satoshi stays behind with Hoopa to help hide it from the shadow Hoopa Unbound. Once our heroes part ways Satoshi and Hoopa make a run for it. Suddenly one of the shadow Hoopa Unbound's giant hands reaches out for our heroes and tries to grab them! Satoshi ducks but is soon attacked by another hand! And another! No matter where they run there's a Ring with a shadow Hoopa Unbound hand waiting to attack. Balza and the others arrive at the tower. Satoshi and Hoopa seem to have lost the shadow Hoopa Unbound. Satoshi comments how it's strange that Hoopa is basically having to run away from itself, causing Hoopa to wonder if the two of them can ever get along. Satoshi says that they definitely will and vows to help the two of them become friends. Hoopa responds by saying that if he does that it'll grant him any wish he wants. Satoshi says he wishes to become a Pokemon Master but adds that it's not the kind of thing Hoopa would be able to just summon. Their conversation is interrupted by one of the shadow Hoopa Unbound's rings. Pikachu uses 100,000 Bolts to ward off the oncoming attack but new Rings keep appearing around them! The shadow Hoopa Unbound decides to attack with all six of its fists at once, causing a huge explosion! As the dust begins to settle we see Lugia darting up from the wreckage with Satoshi on its back! Satoshi instructs Lugia to fly higher but that doesn't stop the shadow Hoopa Unbound; it uses one of its Rings to punch Lugia right in the face! Satoshi, Pikachu, and Hoopa are knocked off the pokemon and land on the roof of a nearby skyscraper. Lugia charges toward the shadow Hoopa Unbound but the Djinn Pokemon materializes a Ring at the last second that transports Lugia to some ocean somewhere! Now with Lugia out of the fight the shadow Hoopa Unbound is free to resume its pursuit of Hoopa. Hoopa decides to stop running it uses its two Rings to summon the speedy pokemon Latios, Latias, and Rayquaza! Satoshi and Hoopa hop on Latios' back while Pikachu hops on Latias'. Satoshi orders the pokemon to Dragon Pulse so the shadow Hoopa Unbound braces itself for impact. But...nothing happens? When the shadow Hoopa Unbound opens its eyes it sees that Satoshi and the others were just feinting and are now making a run for it! Latios and Latias are then ordered to use Psychokinesis and this time they actually seem to damage the pokemon! The shadow Hoopa Unbound is furious now so it uses all six of its Rings to summon legendary pokemon. Kyurem, Palkia, Dialga, Giratina, Primal Kyogre, and Primal Groudon. Satoshi looks on in amazement; this shadow Hoopa Unbound can summon legendary pokemon too!? The Rocket-Dan see all the legendary pokemon flying around - Dialga, Palkia, Groudon, Giratina, Kyurem, and Kyogre - and get really excited! It's like a Legendary Festival out here! Up above, Satoshi sees that he and Hoopa have no shortage of opponents. He orders the Latios, Latias, and Rayquaza that Hoopa had summoned to attack, hoping that they'll be able to buy enough time for Balza and the others to repair the Confinement Urn. Over at the Dessert Tower, the broken pieces of the urn are placed on a pedestal. Balza's Arceus pendant starts to glow. As he begins the ceremony the pokemon who had been chosen to lend their power - Gekogashira, Tailnar, and Hippopotas - all close their eyes and concentrate. When Mary gives the signal our heroes order the pokemon to attack. Gekogashira uses Water Pulse, Tailnar uses Flamethrower, and Hippopotas uses Sand Attack on monuments with the matching elemental symbol on them. Outside, the shadow Hoopa Unbound motions for all the legendary pokemon it had just summoned to attack our heroes all at once. Their powers combine to form an absolutely massive burst of energy that threatens to swallow Satoshi's party whole! The quick thinking Trainer from Masara Town orders the pokemon to counter and succeeds in lessening the impact of the oncoming blast but its power is still far too great. Our heroes are sent reeling back from the shockwave and a huge cloud of dust is kicked up by the impact. The shadow Hoopa Unbound waits for the smoke to clear...but what's this!? Satoshi and the others are fine!? And on top of that all three legendary pokemon have Mega Evolved!? Hoopa cheers. The shadow Hoopa Unbound, not to be outdone, orders the Kyurem it had summoned to transform into Black Kyurem. The Boundary Pokemon uses Freeze Shock on Satoshi and Mega Latios but they're able to use Mega Latios' immense speed to dodge the attack. The sudden turn needed to do so puts the two of them on a collision path with a nearby skyscraper and so Mega Latios makes a second sharp turn upward. This particular course correction, however, has now put Satoshi and Mega Latios right in the path of Palkia! As a sandstorm begins to brew the Spatial Pokemon uses Spacial Rend on our heroes to knock them out of the sky. They fall toward the city below where Primal Groudon is charging up a Solar Beam, waiting for them to get close enough. Satoshi orders Mega Latios to take cover in the sandstorm, causing Primal Groudon's attack to miss and inadvertently hit Black Kyurem instead! Elsewhere, Black Mega Rayquaza jets toward Giratina like a bullet being fired from a gun and uses Dragon Ascent on its opponent. The Renegade Pokemon responds by launching a series of Aura Spheres in all directions. Black Mega Rayquaza slithers out of the way, dodging the attacks and allowing the bursts of energy to come raining down on the city streets below. The townspeople run for their lives. In yet another part of town, Pikachu, riding on top of Mega Latias, is being chased by Primal Kyogre. Pikachu uses Thunderbolt on the Sea Basin Pokemon but the attack doesn't seem to have much of an effect. Primal Kyogre uses Origin Pulse to cause rain to start falling from the sky, which in turn makes the townspeople below wonder if this is a sign of Kyogre's fury. Mega Latias retaliates by using a Dragon Pulse that connects with Kyogre and causes a huge explosion. It doesn't stick around to see if Primal Kyogre's alright, however, and makes a run for it while it still can. As Mega Latias is flying away Giratina appears behind the two of them. The Rocket-Dan, meanwhile, are watching all this from the streets below. Giratina uses Shadow Ball but Mega Latios dodges, causing the attack to miss and head for the Rocket trio instead! Luckily, Musashi's Sonansu is able to use Mirror Coat to repel the Shadow Ball back at Giratina. After breathing a sigh of relief Musashi turns around and sees the Dessert Tower off in the distance. Maybe we should take cover over there...? Meanwhile, Satoshi and Mega Latios are being chased by Black Kyurem once again. Suddenly, Black Kyurem transforms into White Kyurem and uses Ice Burn! The attack knocks Satoshi off the legendary pokemon so Hoopa throws one of its Rings below Satoshi to transport him safely back onto Mega Latios' back. Satoshi thanks the two of them for saving his life. Inside the Dessert Tower the ceremony to restore the Confinement Urn continues as the urn finally begins to take shape. It won't be long now! The shadow Hoopa Unbound, meanwhile, can sense the revival of the urn. It motions for Dialga and Palkia to do something and so Dialga uses Roar of Time. Satoshi and Pikachu, who have now been reunited, see that the shadow Hoopa Unbound has noticed what their friends are doing. The shaking caused by Dialga's attack alerts Balza and the others to their presence as well. Satoshi tells the legendary pokemon to protect Dessert Tower no matter what and orders the Black Mega Rayquaza to whip up a tornado. Mega Latios and Mega Latias are then ordered to use Psychic to help shape the tornado into a barrier that surrounds the tower! Hoopa praises "Saton" for his plan but Satoshi says all the credit should go to the pokemon instead. Dialga and Palkia cannot get through the barrier so an angered shadow Hoopa Unbound reaches through one of its Rings, grabs the top of a skyscraper on the other side, and hurls it at Dessert Tower! The Rocket trio, who have made it to Dessert Tower by this point, see the shaking and wonder if everything's going to be alright. As the tornado barrier continues to protect Dessert Tower Giratina joins Dialga and Palkia outside its border. Dialga uses Roar of Time again while Palkia fires off a beam from its mouth. Satoshi, seeing the oncoming attacks, orders Mega Latios and Mega Latias to use Dragon Pulse to repel them. As the beams hit their targets White Kyurem appears out of nowhere and launches an attack of its own. The shadow Hoopa Unbound watches over the battle as the tornado barrier begins to break. Luckily for our heroes, the Confinement Urn is completed right in the nick of time! Balza steps outside with the urn, opens the lid, and orders the shadows to return! The shadow Hoopa Unbound and all the legendary pokemon it had summoned struggle to stay free but they're all eventually sucked into the Confinement Urn. Balza forces the lid back on the urn but the urn leaps out of his hands as soon as he does. Satoshi runs over and catches the urn to prevent it from shattering again. He tries to get the shadow inside the urn to calm down but it refuses so he orders Pikachu to use Thunderbolt on both him and the urn. Pikachu reluctantly obeys. Satoshi falls over as soon as the attack connects. When Satoshi stands up again a dark aura can be seen all around him. A decidedly evil looks Satoshi look sat his friends and tells them to "Get out of here...!!" Primal Kyogre's "Origin Pulse" behaves very differently from the way it does in the games. In Pocket Monsters Omega Ruby and Alpha Sapphire it's a series of damage-dealing rays of light while in The Archdjinn of the Rings, Hoopa manga it seems to be pretty much a glorified Rain Dance. Satoshi continues to struggle as the dark energy takes over. As Satoshi's friends look on in horror Hoopa decides to fly over and help him out. Satoshi looks up, now speaking with a completely different voice, and tells Hoopa to get away. "Get out of here...I'm the one and only...Hoopa..." Hoopa remembers Satoshi saying earlier that he wanted to help the shadow so it starts to talk about all the good times it's had and how everyone is waiting for it to come back. There's fun to be had in this world, Hoopa says, but that can only happen if it stops being so angry. Satoshi writhes about as the shadow inside begins to stir. The Confinement Urn starts to glow. Satoshi's friends run over to see if he's OK but stop when they notice the legendary pokemon gathered in the sky above them. The dark legendaries have vanished and the only ones left are the good ones that Hoopa summoned to fight them. Satoshi, meanwhile, has reverted to his old self, causing everyone to cheer. The legendary pokemon begin to speak to Hoopa who then translates what they're saying. "They're surprised!" he says. Mega Latias, Mega Latios, and Mega Rayquaza revert to their normal forms. Satoshi thanks all the pokemon for their help. The sun shines brightly over Dessert City. The Rocket-Dan, worn out from their adventure, wonder if it's really all over. Suddenly, the sky above the tower begins to crack! More and more cracks, not unlike those that would show up on a glass door, begin to appear in the sky above Dessert City. Balza tells Satoshi and the others to take cover inside Dessert Tower while they figure out what's going on. A nearby building begins to crumble as the Rocket-Dan run for cover. Balza theorizes that the space around them is warping thanks to all the legendary pokemon that had been summoned there earlier. He then announces that the warped space is creating a wall that will soon trap them all inside if they don't get out of there! The legendary pokemon tell Hoopa that they can't do anything to stop it but they'll do their best to slow it down. Giratina, Dialga, Palkia, Kyogre, Groudon, and Kyurem all fire attacks at the warped space in order to buy our heroes more time. Hoopa smiles and produces two Rings to guide everyone out of the city. Satoshi sees Hoopa eyeing the Confinement Urn in his arms and asks if he wants him to use it to make him more powerful. Hoopa nods. Satoshi pulls off the top of the Confinement Urn and watches as the power inside surrounds Hoopa and transforms it into Hoopa Unbound! This time, however, the power's lost all its evil energy and Hoopa is able to remain its cheerful self even in its powered up form! The giant Hoopa produces six Rings now instead of two and tells Satoshi to help guide everyone to safety. Eventually, the people of Dessert City line up in front of the Rings and pass through them, one by one. Pikachu helps guide the pokemon while the Rocket-Dan happily run toward one of the Rings. Hoopa Unbound looks down at some children and waves at them. On the other side of the Rings, outside the warped space, a Junsa helps control the crowd as they pass through. Before long everyone but our heroes has made it out of the city. Satoshi tells Serena, Citron, and Eureka to go on ahead. They reluctantly obey. Once they're gone he takes Hoopa by the hand and runs toward the Ring. THUD! Satoshi passes through but Hoopa is repelled away, just like before! Tears begin to well up in Hoopa's eyes as it realizes that it won't be able to escape after all. Our heroes, meanwhile, notice that the warped space isn't spreading as quickly as it was. At that moment Mary's Arceus pendant begins to glow. Suddenly Balza, who had gone missing just a short time before, passes through the Ring holding Hoopa in his arms! It seems that Hoopa is able to pass through its own Rings as long as it's accompanied by a native of Arche Valley! Balza hands Hoopa over to Satoshi, who is not from Arche Valley, and as soon as he does the Ring they had just passed through starts to pull Hoopa back in! Eureka runs over and tries to pull Satoshi back in but the power of the Ring is too strong! Balza shouts out for Satoshi to let go of Hoopa but the young Trainer refuses. As the Ring pulls Satoshi and Hoopa further in Satoshi declares that they'll overcome this curse. Will Satoshi and Hoopa be able to escape!? Find out in theaters and in the pages of the graphic novel release on Saturday, July 18th! Dogasu's Backpack is a fan-created website. Pocket Monsters (Pokémon) is © 1995-2015 Nintendo / Creatures Inc. / GAME FREAK, Inc. / Pokémon. No infringement of copyrights is meant by the creation of the web site.